... of God would be fulfilled (Rev. 10:7). What we just had in chapter 7 was the Eternal State and happiness of the righteous in the New Heavens and New Earth, so why does John, after that vision, give us more pictures of God’s judgment upon the earth? These things obviously cannot be read chronologically. In chapter 16, we had the outpouring of the seventh bowl, of which it was said that it will finish the wrath of God (Rev. 15:1), and there is a description of the fall of Babylon and Hell for unbelievers. But chapter 18 goes on to describe the nature of Babylon, i.e., the world system and pronounces judgment upon her (chapters 18-19). How many times does God judge Babylon? In Chapter 14 (the fourth cycle), there was a pronouncement of judgment against Babylon (Rev. 14:8), which just preceded the harvest of the earth, i.e., the Final Judgment (Rev. 14:14-20). In chapter 16 (the fifth cycle), we have God remembering “Babylon the great, to make her drain the cup of the wine of the fury of his wrath” (Rev. 16:19). Well, wasn’t Babylon already judged in Chapter 14? Why is then God pouring out His wrath upon her in chapter 16? In chapter 18 (the sixth cycle), we also have the detailed judgment of Babylon. Just how many times is Babylon actually judged? Obviously once. These judgments which are described are not temporary, but final and irreversible. The most satisfying solution is that the cycles describe the same event (the Last Battle and Final Judgment) from different angles. We had a clear picture of the Final Battle and Last Judgment in chapter 19. The picture of total destruction of the wicked is as clear as and even more exhaustive than Revelation 6:14-17. Having seen that every cycle ends with the Final Judgment and/or Last Battle, what reason do we have to say that what we have in chapter 19 is the Second Coming and Parousia of the Lord Christ, and the Millennium in chapter 20, follows—chronologically—that glorious Second Advent? Everything that we have seen thus far shows us that each cycle ends with the Last Battle and/or Last Judgment. Therefore, isn’t it reasonable to say that chapter 19 ends a cycle and chapter 20 begins another? Yes, I believe so. Chapter 20 does not chronologically follow the Parousia in chapter 19, but starts a new cycle beginning with the Church Age. ...-Commentary"chapter 11), adopted (chapter 12), sanctified (chapter 13) and are kept by his power (chapter 17) through faith (Chapter 14). God bestows every spiritual blessing upon those who are in Christ (Eph. 1:3) to bring them in Christ and to keep them for and in Jesus Christ (Jude 1:1). Only the elect are redeemed by Christ. Other people may appear to have redemption and to be called and justified. We are often deceived by hypocrites, but they cannot deceive God. These spiritual blessings enumerated here belong to the elect alone. As affirmed in 2:1, God is the Sovereign of this world Who moves it to His appointed end. It doesn't just run on its own. So is it also with election, He doesn't merely elect and leave it at that; He also ordains the means by which His elect will come to know Him. We saw that above with the Golden Chain of Redemption how the link of being predestined is followed by the effectual calling of the Spirit, and then justification. God ordains the means by which His people are brought into loving communion with the Trinity. God has loved us, chosen us, sanctified us, sanctifies us and has called us through the proclamation of the glorious Gospel of His beloved Son (2Thess. 2:13-14). And as we have tried to do an exposition of the Golden Chain of Redemption, we saw that the effectual calling came after predestination. Those whom God has chosen for eternal life, He also calls through the proclamation of the Gospel as is said in 2 Thessalonians 2:13-14. He doesn’t leave the elect to themselves, but He sends His messengers to proclaim the Gospel to them, which is the power of God unto salvation (Rom. 1:16). 2Thess. 2:13-14 But we ought always to give thanks to God for you, brothers beloved by the Lord, because God chose you as the firstfruits to be saved, through sanctification by the Spirit and belief in the truth. 14 To this he called you through our gospel, so that you may obtain the glory of our Lord Jesus Christ. Notice the emphasis on justification, adoption, and sanctification in this passage. This has nothing to do with ideas of “being elect and doing whatever sin you want because you're elect.” In fact, it is the opposite. We are to live holy lives unto the glory and honor of God, our Redeemer because we are chosen. We are to be "zealous for good works" (Titus 2:14). Notice that Paul is not ashamed to talk of election and evangelism side by side. He thanks God for His love for them and His election of them, but he also acknowledges that God called the Thessalonians through the proclamation of the Gospel by Paul. He does not see a conflict between sovereign election and evangelism, and neither do Calvinists. 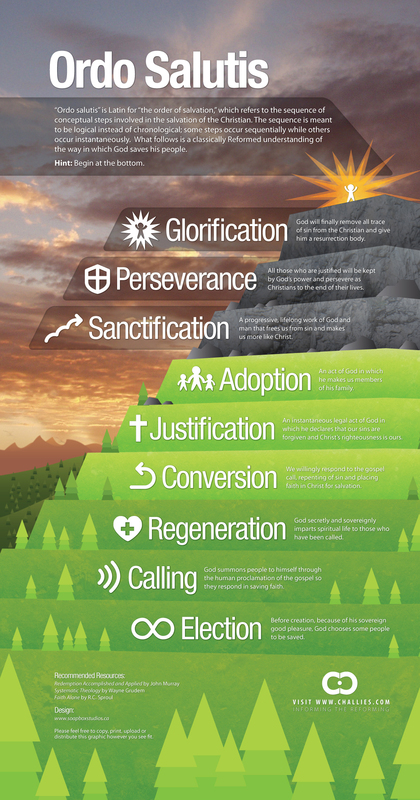 For more on God's effectual calling see chapter 10; for justification see chapter 11; for adoption see chapter 12; for sanctification see chapter 13. ...="https://www.thecalvinist.net/post/1689-Baptist-Confession-Chapter-11:-Of-Justification-Commentary"chapter 11), effectually called (chapter 10), sanctified by His Spirit (chapter 13) and given the precious faith of His elect (Chapter 14), can neither totally nor finally fall from the state of grace (e.g. John 10:28-29; 1John 2:19). If we follow what was said in the previous chapters, as this paragraph begins by enlisting these things, we cannot but expect such a declaration. If God is absolutely sovereign over all things (chapters 3 and 5), even electing, calling, justifying, adopting (chapter 12) and sanctifying us, how can it be that God could fail in His purpose and we be lost to eternal perdition? It cannot. The elect will certainly persevere in the state of grace...to the end. This is the essential difference between true and false faith. True faith perseveres to the end (1John 2:19). This is because the gifts and callings of God are without repentance (Rom. 11:29), in other words, He does not change His mind. Therefore, the elect are safe and He will grant them all these things which are necessary for their final salvation and perseverance. This does not mean that the journey will be easy. In fact, the Confession speaks of storms and floods that arise and beat us. Nonetheless, no one and nothing can shake us off that foundation and rock which by faith we are fastened upon. In these storms and floods and by the temptations of Satan, the sensible sight of the light and love of God may for a time be clouded and obscured for us (so also with our assurance, see chapter 18:4). This does not mean that God has changed; he is still the same. But we are being attacked by the enemy and are fighting or giving into temptation and are in need of restoration. Even in these storms and floods, we may be sure to be kept by the power of God unto salvation and the enjoyment of our purchased possession. The fact that the elect cannot lose their salvation is further shown from the fact that we are engraven upon the palm of His hands (Isa. 49:16) and our names having been written in the book of life from all eternity (Rev. 13:8; 20:15). All this is given for the confidence and encouragement of the believers in God’s faithfulness, goodness, grace, promise, and power. The biblical and Reformed doctrine of perseverance is a great mountain, which gives the saints assurance and faith in God’s almighty power in overcoming sin in us and completely saving us. The doctrine does not teach, contrary to non-Protestant caricatures, that Christians after being saved can do whatever they want to do and still remain saved. Rather, the doctrine teaches that those who have the Spirit of God indwelling in them will persevere in the faith by the almighty power of God. The Lord will chastise, sanctify and lead them toward a holier life. That the doctrine is true and biblical may be seen from many ways (see paragraph 2), including (1) the decree of election, (2) regeneration, (3) justification and (4) Christ’s obedience. ...nf_vi.iv.vi.xvi-p25.1"here, but it will not be treated below. This list is by no means exhaustive. The citations given below are what I could find and what I deemed helpful and understandable for this topic. Many others could be found in the work referenced above. Does it have to be pointed out that the echo of Acts 20:7 is very clearly heard in verse 1? The passage is so closely connected with Acts 20:7 that it contains the same elements there and also connects the Lord's Day explicitly with spiritual sacrifices and worship. In verse 3, Malachi 1:11 is cited. What is more interesting about this passage is the Greek of the first part of verse 1. Literally, it reads, “On every Lord's Day of the Lord.” The Greek phrase is Κατὰ κυριακὴν δὲ κυρίου (kata kuriaken de kurion), which is a strange way to refer to the Lord's Day. The word kuriaken is used here and it is the strong adjective meaning “belonging to the Lord” which is used in Revelation 1:10. What is interesting is that the word for “day” is absent in the Didache, though this does not cast doubt upon the fact that what is being spoken of here is, in fact, the Lord's Day. What this indicates is that the designation “Lord's Day” was so popular and in Christian usage that it was enough to use kuriaken without “day” (hemera). That this is speaking of the first day of the week is confirmed by its reliance upon Acts 20:7. It is very interesting to see how biblical language, New Testament language to be specific, is so influential so early on. Neither the author of the Didache nor John invented the designation “the Lord's Day”, but both authors use it expecting their readers to understand to which day they refer. The phrase was in common usage and was coined prior to the writing of the Didache and Revelation. The grace of faith, whereby the elect are enabled to believe to the saving of their souls, is the work of the Spirit of Christ in their hearts, and is ordinarily wrought by the ministry of the Word; by which also, and by the administration of baptism and the Lord's supper, prayer, and other means appointed of God, it is increased and strengthened. By this faith a Christian believeth to be true whatsoever is revealed in the Word for the authority of God himself, and also apprehendeth an excellency therein above all other writings and all things in the world, as it bears forth the glory of God in his attributes, the excellency of Christ in his nature and offices, and the power and fullness of the Holy Spirit in his workings and operations: and so is enabled to cast his soul upon the truth thus believed; and also acteth differently upon that which each particular passage thereof containeth; yielding obedience to the commands, trembling at the threatenings, and embracing the promises of God for this life and that which is to come; but the principal acts of saving faith have immediate relation to Christ, accepting, receiving, and resting upon him alone for justification, sanctification, and eternal life, by virtue of the covenant of grace. This faith, although it be different in degrees, and may be weak or strong, yet it is in the least degree of it different in the kind or nature of it, as is all other saving grace, from the faith and common grace of temporary believers; and therefore, though it may be many times assailed and weakened, yet it gets the victory, growing up in many to the attainment of a full assurance through Christ, who is both the author and finisher of our faith. Such of the elect as are converted at riper years, having sometime lived in the state of nature, and therein served divers lusts and pleasures, God in their effectual calling giveth them repentance unto life. ...(1Cor. 1:30; 2Cor. 5:21; chapter 8:5). We stand in this righteousness by faith, but even this faith is not of themselves but is the gift of God (Eph. 2:8-9; see also Chapter 14:1). Therefore, even the condition for our justification and life with God was provided by God. This is the glory and greatness of the New Covenant of Grace in which we stand and have our relationship with God. All the requirements of the covenant are provided by God through His Spirit based on Christ's work and obedience. "If any one saith, that by faith alone the impious is justified; in such wise as to mean, that nothing else is required to co-operate in order to the obtaining the grace of Justification, and that it is not in any way necessary, that he be prepared and disposed by the movement of his own will; let him be anathema," (Council of Trent, Canons on Justification, Canon 9). Rome, in these words, has denied the Gospel of Christ. They place their curse upon the Protestant and biblical doctrine of justification by faith alone. which is the Gospel of our salvation. They have denied justification by faith alone, which I will seek to make a case for below. They confess that faith is necessary, but it is not enough. They confess that grace is necessary, but it is, again, not enough. I assert and will seek to prove that the Bible teaches that faith alone is that which justifies the wicked and not grace/faith plus anything in us. ...ata-footnote-id="t4cdf">^ Jamin Hüber in Recovering A Covenantal Heritage: Essays In Baptist Covenant Theology. Edited by Richard C. Barcellos. (Palmdale, CA: RBAP, 2014). pp. 384-385. ^ See Chapter 14, "Acts 2:39 in its Context (Part 2): Case Studies in Paedobaptist Interpretations of Acts 2:39" by Jamin Hübner in Recovering A Covenantal Heritage: Essays In Baptist Covenant Theology. Edited by Richard C. Barcellos. (Palmdale, CA: RBAP, 2014). pp. 417-448. ^ As quoted in ibid. p. 400. ^ Stan Reeves. A Reformed Baptist View of I Cor. 7:14. ^ Collins, Believers Baptism. p. 15. Footnotes removed. ^ John M. Frame. Systematic Theology: An Introduction to Christian Belief. (P&R Publishing, 2014). p. 1063. ^ John Norcott. Baptism discovered plainly and faithfully, according to the word of God wherein is set forth the glorious pattern of our Blessed Saviour Jesus Christ. 1694. pp. 6-7. ^ Grudem, Systematic Theology. p. 967. ^ Mounce, Expository Dictionary. p. 52. ^ Vine's Expository Dictionary of NT Words. Baptism, Baptist, Baptize. ^ Strong’s Definitions in The Blue Letter Bible. G907. a, b Joseph Henry Thayer's Greek Definitions. Taken from the TheWord Bible Software. See reference for the Strong's number. ^ TDNT, from BibleWorks. Number 123, p. 93. ^ Strong, Systematic Theology. p. 933. ^ Grudem, Systematic Theology. p. 967, n4. ^ Louis Berkhof. Systematic Theology. (Grand Rapids, Michigan: Banner of Truth Trust. 1963). p. 630. ^ The Cambridge Bible for Schools and Colleges. Edited by J. J. S. Perowne. Taken from the TheWord Bible Software. In loc. ^ Grudem, Systematic Theology. p. 968. ^ Collins, Believers Baptism. p. 7. ^ William Robertson Nicoll. The Expositor's Greek Testament. Taken from the TheWord Bible Software. In loc. ^ Grudem, Systematic Theology. pp. 968-969. ^ Collins, Believers Baptism. pp. 6-7. ^ Waldron, Exposition of 1689. p. 448. ^ The London Baptist Confession of Faith | Exposition of Chapter 29. Herald of Grace. ^ Norcott, Baptism discovered plainly and faithfully. pp. 19-21.